If you are interested in having me teach one of these classes at your store (Canada or Australia) please contact me. I will consider repeating some of these classes in Ottawa for a minimum of six participants; let me know if you are interested. Happy New Year! Are you needing to replenish your stash of cards or whip up a gift for a friend? 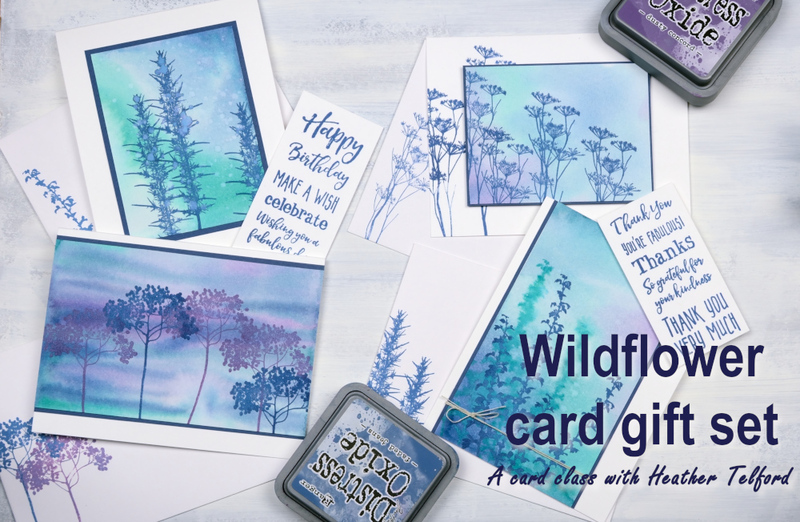 In this class we will create cards with a wildflower theme. We will be using Darkroom Door stamps and a range of distress stains and oxide inks to make a gift set of 4 cards with matching envelopes and packaging. Each set will be unique as we personalise our cards with stamp, sentiment and colour choices. Optional but helpful: MISTI or stamp positioning tool, heat tool, distress stains and oxide inks in colours of your choice. In this class we will create three Christmas cards featuring some of winter’s natural beauty. We will be using Penny Black stamps and a range of dye inks and markers to create watercolour style scenes and Christmas flora and foliage. Optional but helpful: MISTI or stamp positioning tool, heat tool, your own sparkle or shimmer products. 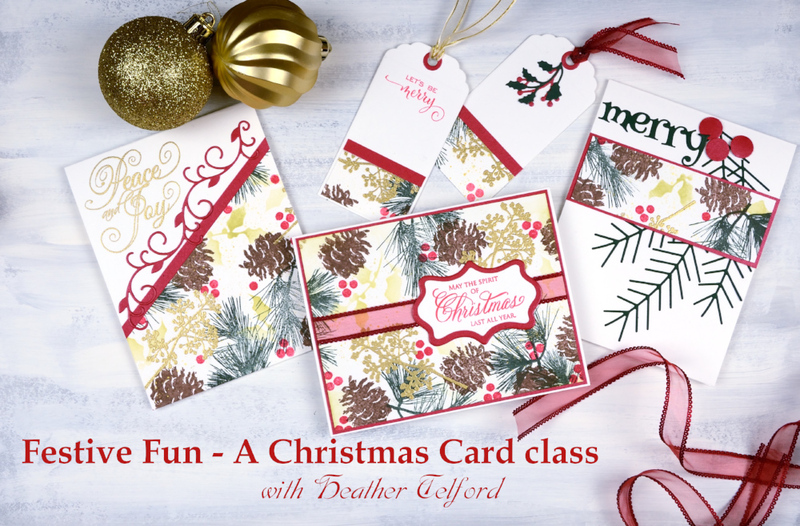 In this class we will create three Christmas or winter cards in a vintage style. We will begin with a simple monochrome sepia design then move on to more detailed designs with added colour. We will work with a range of scenic winter stamps including small wintry vistas and larger detailed landscapes. We will be working with Penny Black stamps, distress inks and watercolour pencils. Join me for some fun with the ‘City Stacks‘ stamp set and co-ordinating dies from Concord & 9th. In this class we will create a one stamp, a two stamp and a three stamp fancy fold card. You’ll experience the versatility of these sweet stamps, add some colour with watercolouring and learn a tri-fold card technique. Do you have a few background stamps in your stash? Well, this is their chance to take centre stage. In this class we will use a variety of old and new techniques to make our background stamps the feature of our cards. We will use different inks and watercolour mediums to add colour to stamped and embossed backgrounds. I will have a stack of background stamps at your disposal but please bring your own along also. To give you a headstart on your festive card and tag making I have designed a class where we will stamp one decorative panel then cut it into smaller pieces to make a selection of cards and tags. I will have more layouts than those shown above for your inspiration in class. We will use Penny Black stamps and dies to create three bright, colourful cards. If you want to add glitter and sparkle feel free to bring along embellishments and products which will add shimmer and shine in clear, gold or red. In this class we will paint three galaxy themed panels, one as a painting and two for card fronts. We will use three different mediums and vary our techniques. 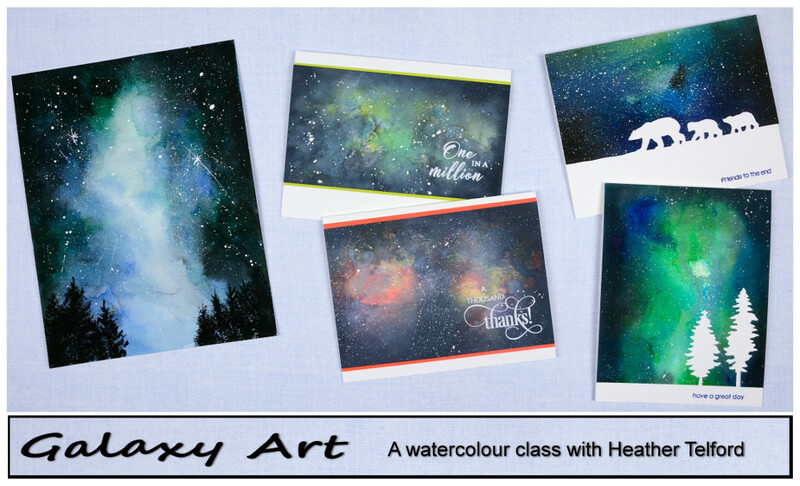 We will have a range of colours to work with so each galaxy created will be an original work of art. Optional but helpful: Heat tool, MISTI or stamp positioning tool, brusho or colorburst paints if you have them, distress oxide ink pads in colours of your choice (including black soot if you have it) gansai tambi or other pan paints. We will use no more than four colours in each painting so feel free to bring a small selection of your paints or oxide pads rather than the whole set if you wish. Are you ready to see flowers bloom and grass waving in the breeze? 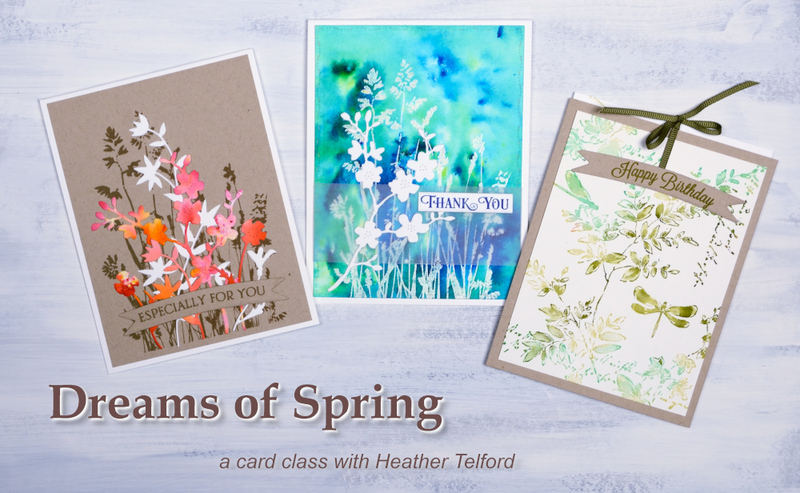 In this class we create three colourful floral cards. Each stamped and watercoloured panel will fill the card front. We will use Penny Black stamps along with dye-based inks and markers to create three unique cards. Do you have coloured pencils sitting in your crafting stash? If you would like to incorporate them into your stamping and card making this is the class for you. In this class we will learn techniques for colouring and blending with pencils to create subtle and dramatic effects. We will personalise our projects with colour and stamp choices. Using black, white, natural or cream panels stamped with Penny Black images we will create three cards. You will need a set of coloured pencils; it does not need to be a large set and can be wax based or oil based. (If you have questions please contact me). If you would like to bring your own sentiments you will have the chance to add a sentiment to some of your panels. I will bring a selection for class use. 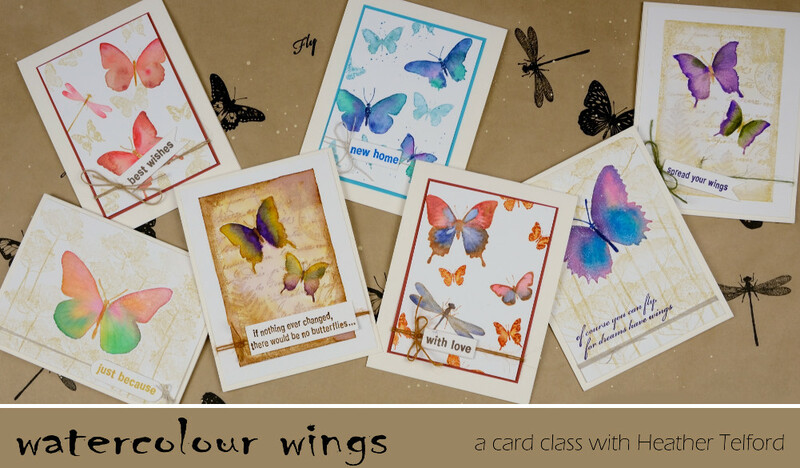 Hunt out your butterfly stamps or use mine to paint watercolour wings on a range of large and small winged creatures. Using Darkroom Door stamps, distress inks, watercolour paints and a little sparkle we will create panels featuring loose blends as well as detailed patterns. We will complete three cards with matching envelopes and head home with a technique you can apply to other detail or collage stamps in your stash. 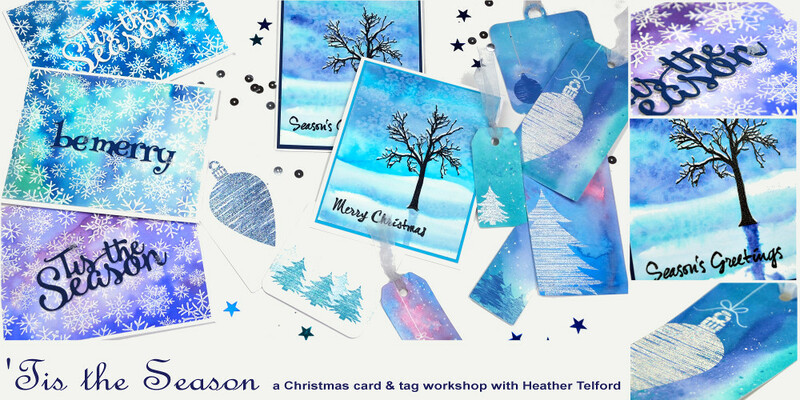 In this class we will create two snowy Christmas cards and a handful of sparkly, colourful tags. We will personalise our projects with colour and stamp choices. We will be using Darkroom stamps and Penny Black dies, Ranger distress stains and distress oxide inks. In this class we will create three winter treescapes to be featured on Christmas cards or used without sentiments for any event of the season. We will personalise our cards with colour choices and incorporate a range of techniques for creating snowy scenes. We will be using Penny Black stamps and dies, distress stains and memento inks. 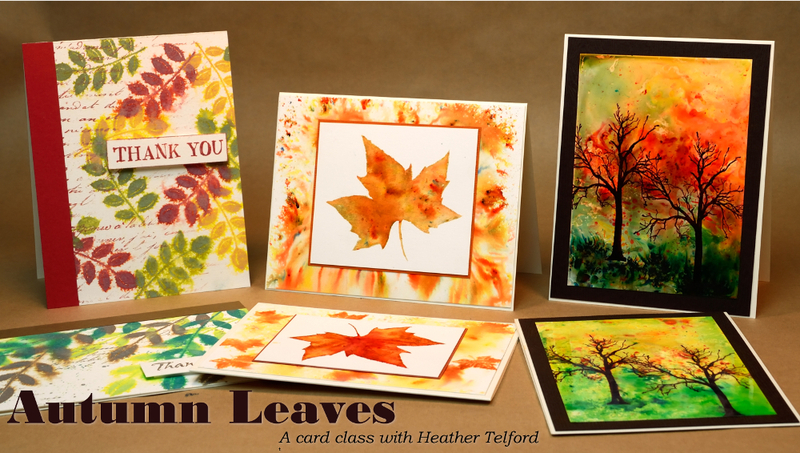 In this class we will create three autumn themed cards featuring Darkroom Door stamps. We will personalise our cards with stamp and colour choices using brusho paints, distress oxide and distress dye inks. In this class we will create blended backgrounds using three different techniques then add silhouettes to the foreground. We will personalise our cards with colour and stamp choices ending up with three atmospheric scenes. We will use Penny Black stamps and dies along with inks from several companies. Optional but helpful: distress stains, distress oxide inks & blending tools/foam in a few colours you’d like to use (all for your own use, I will have mine to share with the class), MISTI or similar stamp positioning tool. 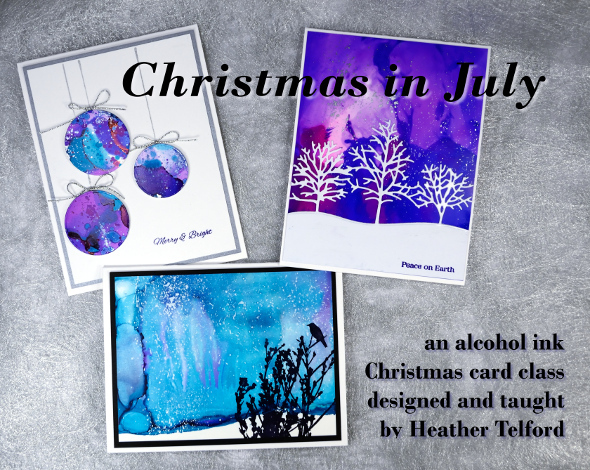 Even though summer has barely arrived I invite you to get started on Christmas cards anyway. 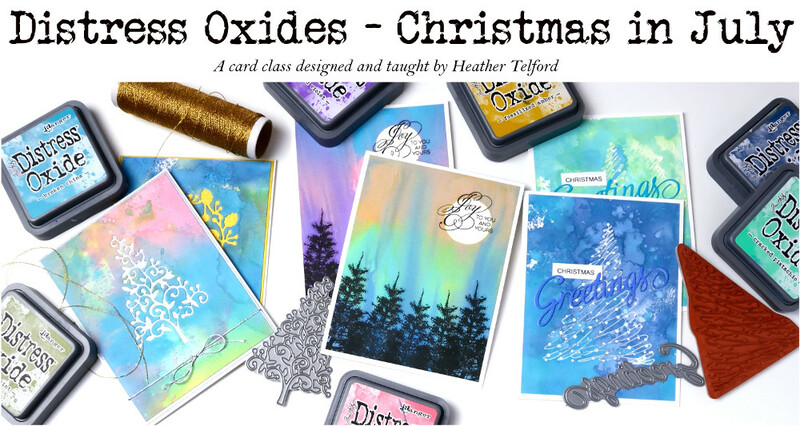 Join me for some fun with new Distress Oxide inks and Penny Black stamps and dies. We will create colourful backgrounds with the new inks, add some shimmer and shine then finish them off with images and sentiments. There will be plenty of scope for personalising your designs with colour and image choices. Please bring the following: adhesive, liquid adhesive, paper trimmer, scissors, tweezers, acrylic block, water jar, size 4-6 watercolour paintbrush, spritzer, masking tape, craft mat or impermeable surface to layer ink on. Optional but helpful: distress oxide inks, black ink pad (all for your own use, I will have mine to share with the class) stick it adhesive if you want to make gluing die cut images easier! While tulips bloom round Ottawa lets add colour to some fabulous Darkroom Door flower stamps using bold and creative techniques. We will use alcohol inks and brusho watercolour powder to create bright backgrounds, add photo realistic stamping over the top and finish the cards with eye-catching embellishments. Please bring the following: adhesive, dimensional adhesive, paper trimmer, scissors, acrylic block, spritzer, craft mat or impermeable surface to layer ink on. Lets celebrate spring with some floral stamping and painting. Using Penny Black brushstroke stamps we will fill three cards with watercolour blooms that look freshly picked from the garden. We will use a couple of techniques perfect for this type of stamp and a range of glowing colours to personalise our designs. Please join me for some vintage style elegance. In this class we will use Darkroom Door stamps and distress ink products to create three watercolour tea themed cards with matching envelopes. We will work with both detailed images and loose watercolour washes. We will have a wide range of colours to work with making it possible to individualise your cards. adhesive, dimensional adhesive, paper trimmer, scissors, painter’s tape, round watercolour paintbrushes size 8-10 and size 2, water jar, firm surface to tape watercolour panel to, acrylic block, craft knife and mat for fussy cutting. 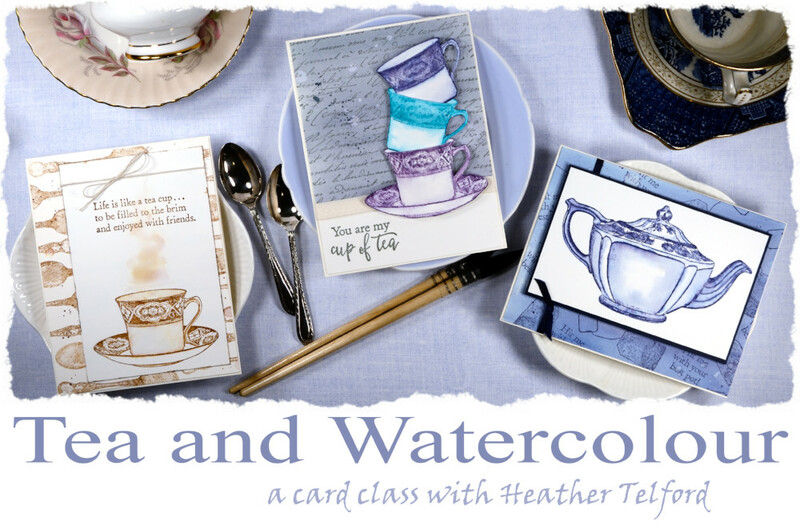 If you want to try some watercolouring but are a bit apprehensive then this class is for you. 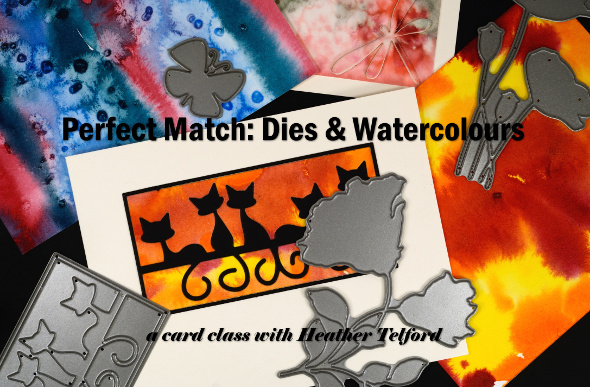 If you love watercolour and can’t get enough, this class is for you too! In this class we will use both watercolour powders and pan paints to create three emboss resist cards. We will play with colour and application methods then assemble cards with co-ordinating elements to add interest and dimension. We will emboss with Penny Black stamps and complete our cards with Penny Black sentiments and die-cuts. Feel free to bring your own watercolour paints if you wish; I will have Brusho, Colorburst and Gansai Tambi pan paints for class use. MISTI, heat tool, clear wink of stella brush pen, watercolour paint powders or pan paints if you have some. Do you feel like looking at something other than snow? If so, this is the class for you. 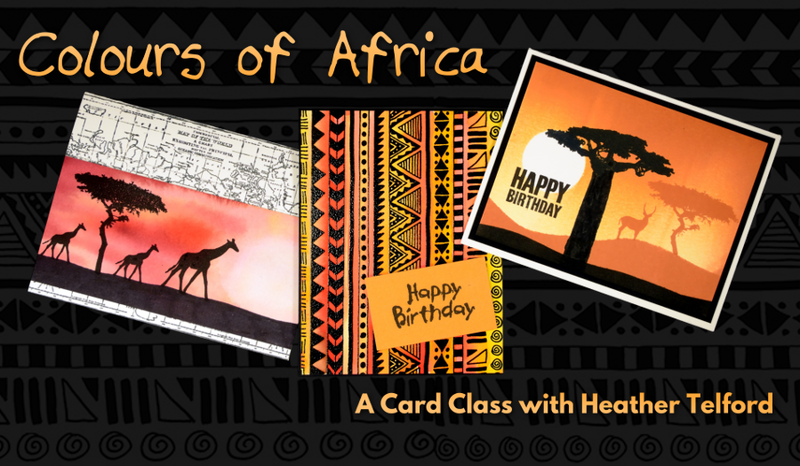 Join me to create some warm toned, African themed cards with Darkroom Door stamps. We will use a variety of mediums and techniques to create silhouetted scenes and a colourful pattern. It’s time to celebrate a northern Christmas with some snowy yet colourful cards depicting the northern lights. 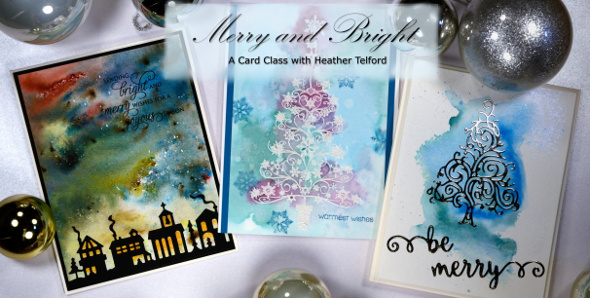 In this class we will use three different methods to create wintry cards with glowing skies. We will pair Penny Black stamps and dies with watercolour, sponging and heat embossing techniques There will be the opportunity to choose from a range of colours to personalize your designs. MISTI, clear wink of stella brush pen, heat tool, and if you own it already, ‘Woodland Beauty‘ stamp set for your personal use. Even though you might not be decking your halls just yet, you can add some cones, berries and baubles to your Christmas cards. In this class we will create watercolour effects with markers and distress stains. We will add some shimmer and shine with both heat embossing and wink of stella. There will be the opportunity to choose colours, sentiments and die-cuts to personalize your designs. 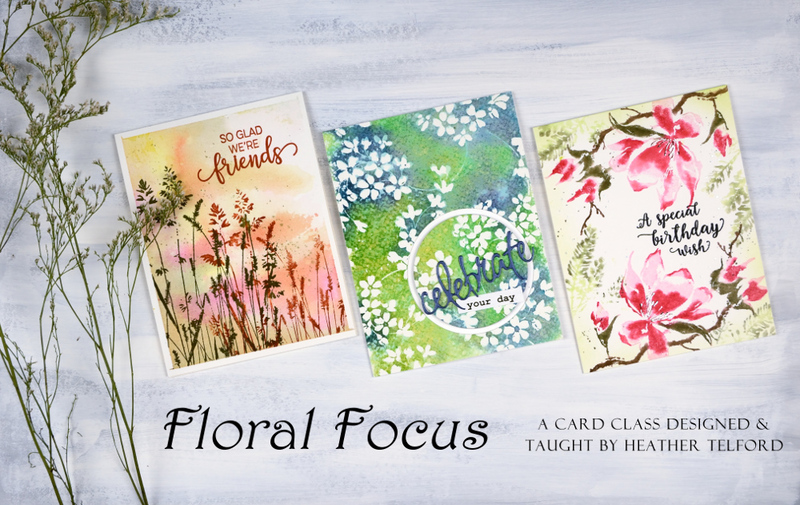 Let’s celebrate the beauty of summer with some floral cards before the crisp fall air blows in. In this class we will combine embossing and watercolour painting to create three different garden themed cards. We will learn some colour theory as we work with a limited palette of 3-4 paint colours. We will add some shimmer and shine to a couple of the cards with both embossing and liquid metals. There will be the opportunity to choose colours and sentiments to personalize your designs. 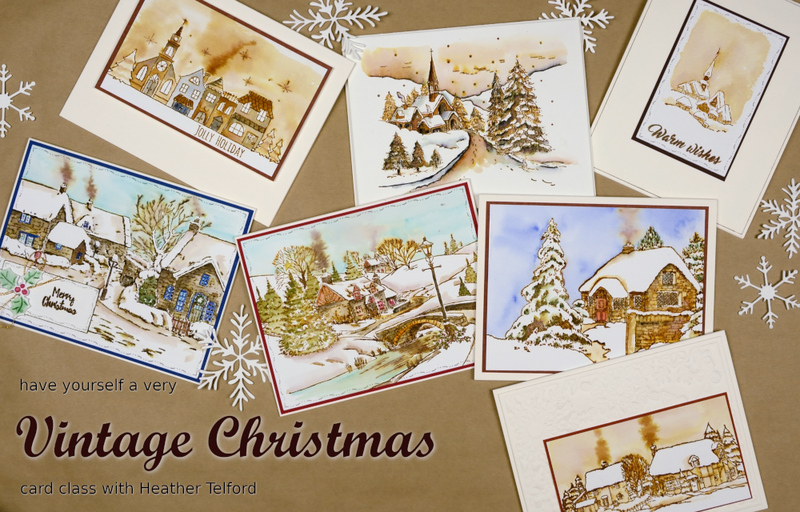 Are you keen to get started on your 2016 Christmas cards or perhaps you would like to create some crisp snowy scenes in the midst of our summer heat? 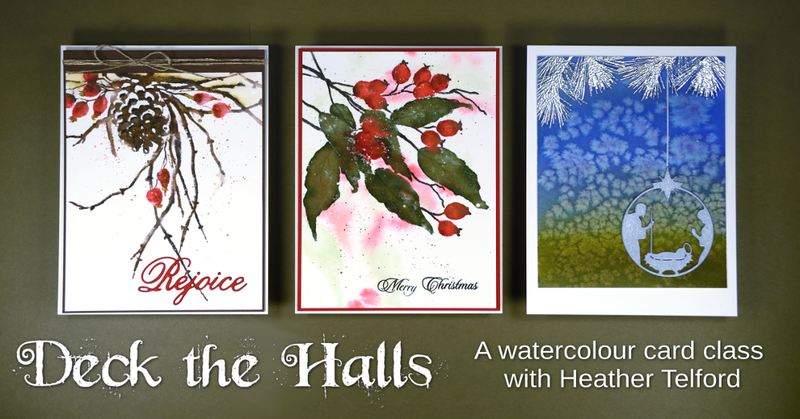 In this class we will incorporate the bright and beautiful colours of alcohol inks into three different Christmas cards. We will learn two ways to use alcohol inks to create the northern lights and turn abstract patterns into twinkling Christmas balls. We will have a range of coloured inks to work with so you can customise your designs. In this class we will use the Penny Black cling stamp ‘Shade Canopy’ to create four cards, one for each season of the year. Each card will be in the watercolour style but techniques will vary from card to card. I will provide a range of sentiments for completing the cards. adhesive, dimensional adhesive, paper trimmer, scissors, cutting mat or firm surface to tape watercolour panel to, painter’s tape or masking tape, watercolour paint brushes – 1″, no. 8 round, no. 2 or 3 round, water jar, water spritzer, heat tool. In this class we begin by experimenting with alcohol inks on a range of surfaces. We will use different tools and techniques to apply the inks creating patterns, prints and random designs. After spending the first half of the class creating patterned panels we will turn them into unique cards by adding stamping, die cuts and hand drawn details. Participants will need their own die cut machine (such as a Big Shot, Cuttlebug or similar) and can bring a selection of their own dies or use the ones I bring. 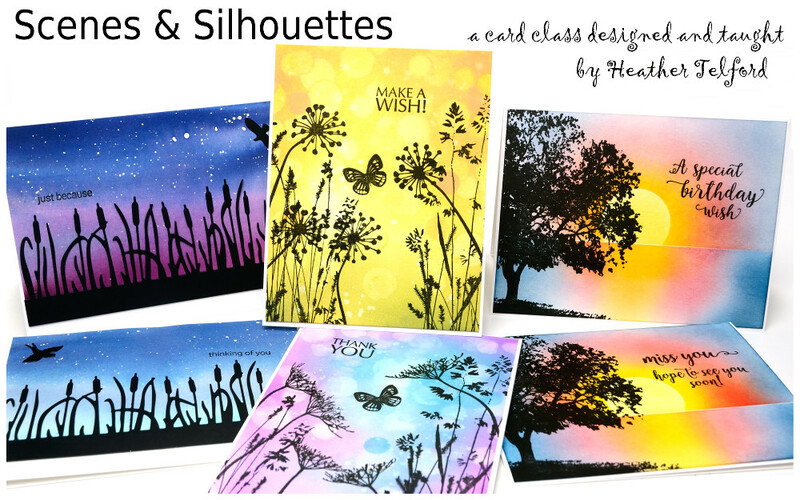 All cards will look different from each other and from the examples shown above as participants will make choices about colours, designs and dies to use. In this class we will use Brushstroke stamps from Penny Black to create several floral watercolour panels. Brushstroke stamps are taken from painted images so watercolour techniques work beautifully with them. 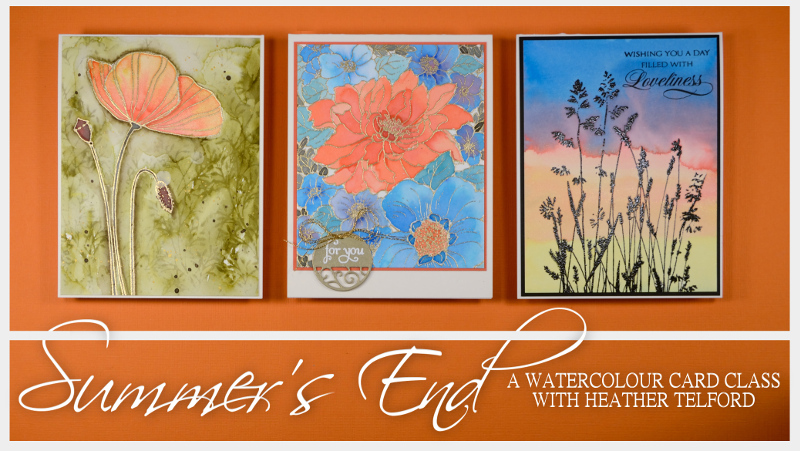 During the class I will demonstrate different ways I create panels with brushstroke stamps. I will use a variety of images and mediums to stamp in a loose, impressionistic style and a more detailed realistic style. Stamps, paper and mediums will be available for class members to create their own panels in a range of styles and colour combinations. Participants should bring : painters tape, paper trimmer, scissors, cutting mat or board to tape watercolour panel to, one of each of the following sizes of round watercolour brushes: size 1 or 2, size 4 or 5 and size 8 or 10 , water jar, water spritzer. If you have the following items please bring them also: MISTI, water based markers such as Memento, Distress or Tombow, watercolour pencils, clear wink of stella brush marker, brushstroke stamps for your own use. In this class we will create three bright and happy watercoloured cards for a variety of occasions. We will use different techniques to create unique panels and Penny Black stamps and dies to complete our projects. Every card will be different as we make choices about colours and layout. Feel free to bring your own sentiments or use mine to add the message you want. Optional but helpful: MISTI, watercolour powders for your own use, sentiment stamps for your own use. This workshop is a ‘One sheet wonder’ workshop. We will create a vibrant watercolour panel in colours of your choice then cut it up into smaller components to create two simple cards, two tags and an ornament which opens up to reveal a message. We will be using watercolour powders to create unique panels and Penny Black stamps and dies to complete our projects. Please bring your own die-cutting machine or arrange to share with a friend. Optional but helpful: MISTI, watercolour powders for your own use, snowflake dies or stamps for your own use. In this class we will create three watercolour style cards using clear and cling stamps from Penny Black. By stamping, embossing and painting we will bring to life three snowy woodland scenes. Previous experience with watercolour technique will be helpful. In this class we will be use several different techniques to add colour and sparkle to three Christmas cards. We will use Penny Black dies and stamps, watercolour and foiling to create cards with a little shimmer and shine. In this class we will be working with some gorgeous decorative papers from Grafiche Tassotti, an Italian paper company specializing in high quality papers with intricate and original designs. We will pair the papers with a variety of Penny Black dies to create three vintage style feminine cards and a whimsical masculine card. 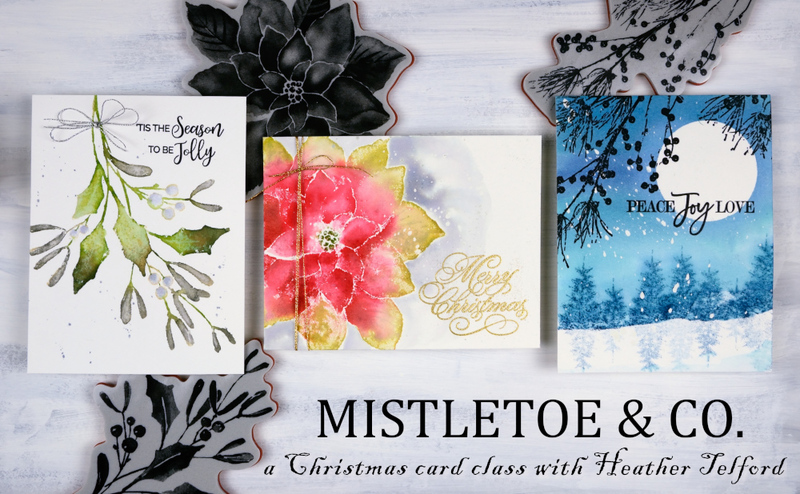 We will use shaping, sponging, splattering and layering to give each card its own flair. If you love to work with patterned papers or have a whole stack at home waiting for inspiration this class will give you some new ideas to spark your creativity. embossing tool with large round ball end(I will have some spares if you do not have one), ¼”hole punch, ‘Swirling Wings‘ die from Penny Black(if you happen to own it already), Stitched Edges dies from Penny Black or another decorative edge die at least 4½” wide (again, only if you happen to own it already). In this class we begin by creating three watercolour panels which we will turn into cards. Participants will need their own die cut machine (such as a Big Shot, Cuttlebug or similar) and a selection of their own dies. We will learn the method for creating stacked die-cut, inlaid die-cut and repeated die-cut designs. If in doubt about the suitability of your dies bring them along and we will discuss options during class. Please note that all cards will look different from each other and from the examples shown above as participants will make choices about colours, designs and dies to use. This workshop is aimed at card makers and scrapbookers who would like to learn how to add some basic watercolour effects to their projects. It is a workshop where those interested in watercolour painting can experiment with paints and learn the basics. While I am not a formally trained watercolour painter, I am a self-taught enthusiast ready to guide you in a workshop setting. We will experiment with washes, textures and masking using both tube and pan paints. We will be creating painted samples (not cards) so that we will have reference points to use in the future when creating finished pieces of art for projects. I will provide watercolour paints to share if you do not have your own. In this class we will use Penny Black stamps to create three watercoloured cards. We will use Memento dye inks, distress stains and watercolour pencils as we learn different techniques for watercolour backgrounds and ‘painting’ with both outline and brushstroke stamps. Participants should bring : adhesive, dimensional adhesive, painter’s or masking tape, a cutting mat or board to tape watercolour paper to, scissors, pencil, black pigment ink pad, waterbrush or size 3 or 4 round watercolour brush. In this class we will use Penny Black stamps and dies to create three very different butterfly themed cards. This class is full of techniques you can use with stamps and dies. Using watercolouring, brayering, masking and emboss resist we will create artsy, bold and whimsical butterfly cards for a variety of occasions. In this class we will create three cards using Penny Black stamps and diecuts. We will use both distress stains and memento inks for watercolouring and masking fluid to create falling snow.